Ireland, 1922, Thom Provisional Govt. 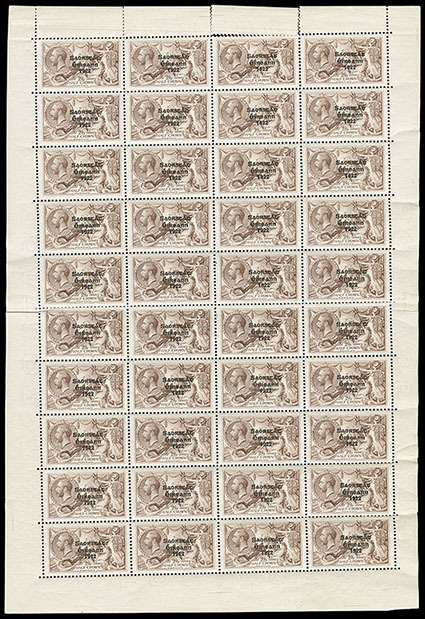 overprint on King George V "Seahorse", 2s6d sepia brown, plate 5a, complete sheet of 40, o.g., never hinged, folded between stamps horizontally and vertically, with occasional faint toning and perf separations, F.-V.F., an extremely rare complete sheet. SG No. 44. Scott No. 36 $20,000 for singles. 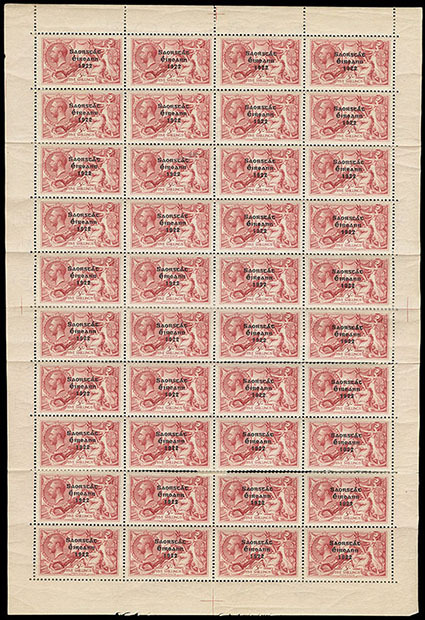 Ireland, 1922, Thom Free State overprint on King George V "Seahorse", 5s rose carmine, complete sheet of 40, o.g., about half never hinged, varieties such as "S" over "E" (R.9/2) and minor re-entry (R.6/3), 9th and 10th rows with reinforced perf separations, F.-V.F. SG No. 65. Scott No. 57 $3,600 for normal hinged singles. 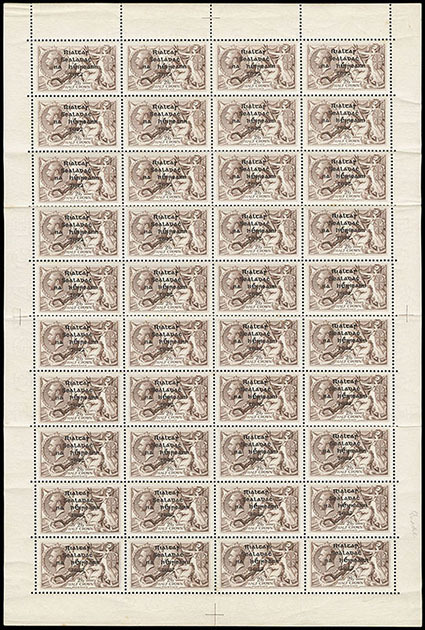 Ireland, 1925, Free State overprint on King George V "Seahorse", narrow date, 2s6d chocolate brown, plate 7 (Dublin Castle), complete sheet of 40, o.g., stamps never hinged, folded between stamps and some hinge reinforcements and perf separations in margins, F.-V.F. SG No. 83. Scott No. 77 $5,000 for singles. 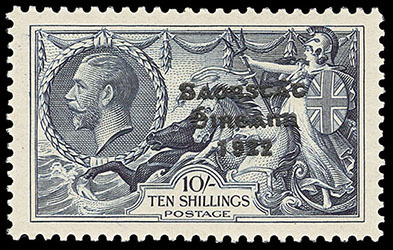 Ireland, 1925, Free State overprint on King George V "Seahorse", narrow date, 10s dull gray blue, top sheet margin pane of 12, o.g., never hinged, re-entries to "0" of "10/" (R.1/3, R.2/3), folded between stamps, Very Fine. SG No. 85. Scott No. 79 $5,100 for normal singles. Ireland, 1935, Free State overprints on King George V re-engraved "Seahorses", 2s6d to 10s complete, o.g., never hinged, rich deep colors, a Very Fine set; each with 2008 P.F. certificate. SG No. 99/101. 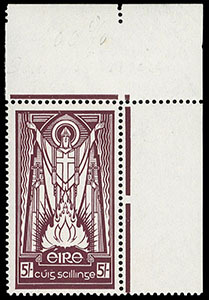 Ireland, 1937, St. Patrick, 2s6d to 10s complete, top right corner margin singles, o.g., never hinged, rich deep colors, 10sh with gum tone spot in selvage only, Very Fine, an attractive position set. SG No. 102/04.